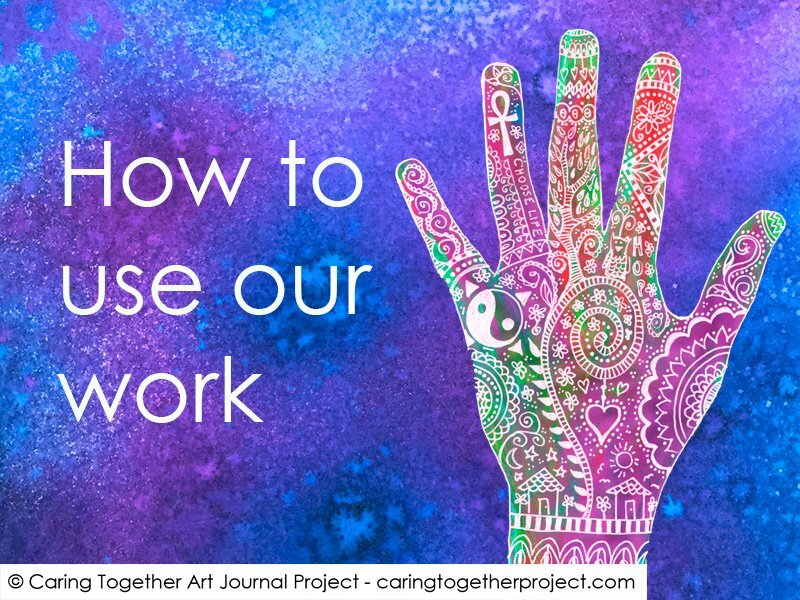 Stories, artwork and other resources on this site have been shared by a variety of people, including mental health carers, family members, consumers and practitioners. In all cases the authors retain copyright of their work, and how it may be used is their choice. To simplify things, contributions have been sorted into two categories. 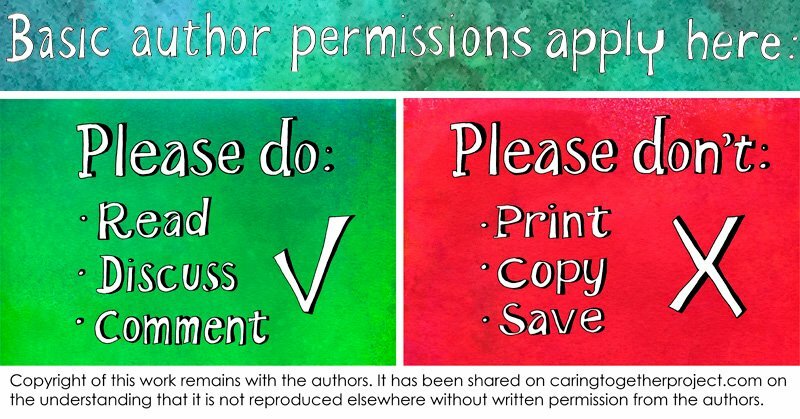 They are basic author permissions (the default) and special author permissions which I explain below. In most cases stories and artwork have been shared on the condition that they are not printed, copied, edited or distributed outside this website. These stories have been kept to members only areas which require a login, and we ask that you be especially respectful of the content, which is often quite sensitive. Please remember that it is one thing to share a story or artwork on a members only website in order to help others, and quite another to walk into a mental health service and see your story publicly displayed on the wall or making the rounds of Facebook without your permission. If you would like to use these resources for training or support purposes please refer others to register and login to read the stories for themselves. They can then be discussed in a group context. Please do not print or copy the content as handouts or a presentation unless you have written permission from the author. Linking to the page is fine. If there are no written instructions to indicate otherwise, assume that these permissions apply. If you would like to ask for permission to use these resources in another context (such as licensing artwork), or you would like to get in contact with a particular author, please contact us. We can then forward your request if it is appropriate. You can read more about licensing here. 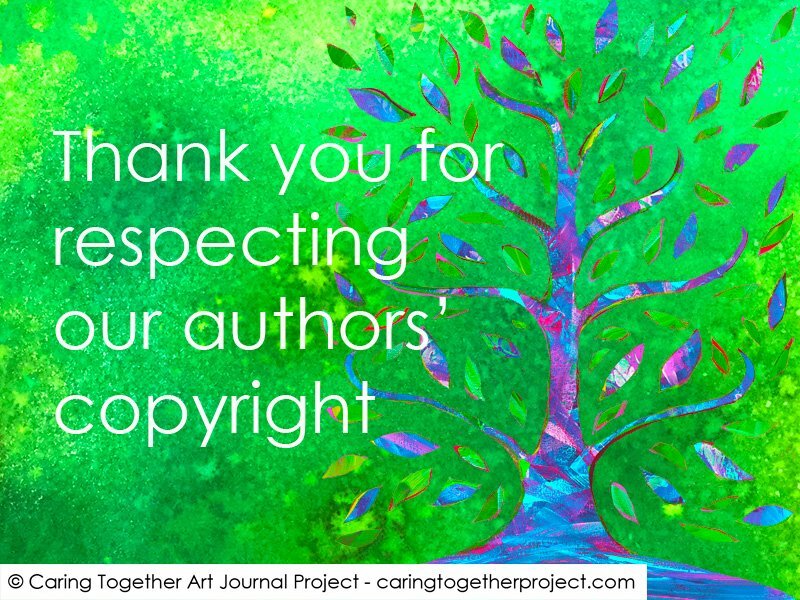 In some cases authors have expressly given permission for their work to be shared for educational or support purposes under specific conditions. This will generally be the case when work has been created by mental health or carer services. If this is the case the conditions will be stated in writing. If you are in doubt please contact us. All resources are shared on this website for non profit purposes only. If you stand to make any money out of our work, either directly or indirectly, then you will need to make a licence arrangement with the original author which may be fee based. You will also need to arrange a special licence if you wish to use images, videos or stories in other contexts. You can find out more about that here. All of the work on this website is copyrighted, with all rights reserved by the respective authors – including those who have chosen to remain anonymous on this website. Some authors are also registered with Copyright Agency Limited. You can learn more about copyright from the Australian Copyright Council. Many people assume that being able to grab an image or work from the internet, either by downloading it or using a screenshot, gives them the right to use that work as they like. That is not the case – it is generally a copyright infringement – and it is particularly frustrating in situations such as ours, where so much is already shared. It is not nice to find your work being used without permission, and it makes it difficult to continue to share. We understand that it can be difficult to know what to do so we try hard to be clear about it. If in doubt please feel free to contact us.